1. The Great One prepares early for the shot with a full shoulder and hip turn as he takes the racket back. His legs are nice and low which will give him a wide base and a straight spine. 2. Notice how Roger’s shoulders rotate further than his hips so he is coiled up like a spring and ready to release the racket with massive acceleration into the ball. 3. The racket has dropped ready to accelerate forward and strike from below the ball. Roger’s leg strength allows him to easily hold his wide base as he gets ready to strike. The single-handed backhand is one of the harder shots to master, particularly when dealing with high-bouncing balls or against opponents who get good depth and hit heavy topspin. If you're making contact at or above shoulder height then creating power will be difficult. On these balls just focus on getting the ball back deep with plenty of height over the net onto your opponent’s weakness. If you get a shorter ball then step in and go for it. If you're new to the shot we suggest you start by using the Eastern single handed backhand grip then, if you want to experiment with trying to get more topspin on the ball, move your hand around to the extreme Eastern or Semi-Western variation. 4. 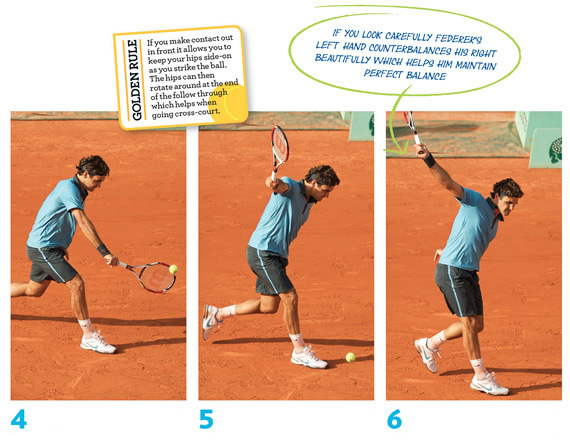 A feature of all Roger’s shots is his discipline of watching the ball on contact and resisting the temptation to raise his head and look at the target. The shape of his base has hardly altered. 5. The racket head speed helps lift his front leg as it drives upwards through the ball, yet his hips and shoulders are still side-on allowing his racket to stay behind the line of the ball. 6. The front leg is fully extended, the back leg is drawing up for balance, the shoulders open slightly and the racket will fi nish high above his head – majestic balance. If you make contact out in front it allows you to keep your hips side-on a s you strike the ball. The hips can then rotate around at the end of the follow through which helps when going cross-court. Using one hand to hit a topspin backhand (which gives you less power than using two) means getting your bodyweight into the shot to create power is crucial. 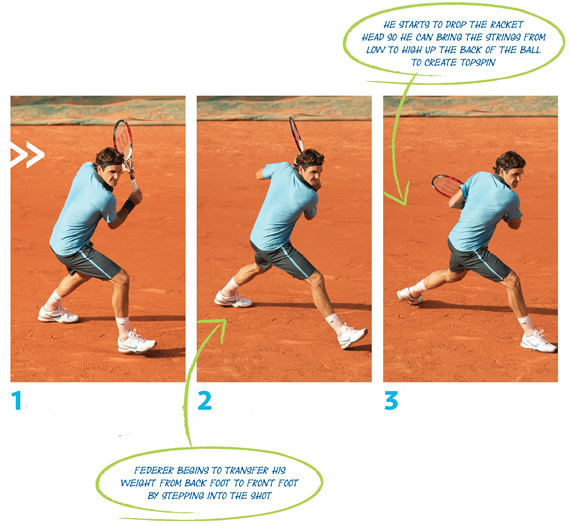 The key – as Federer is demonstrating – is to make contact out in front of your body and to transfer your bodyweight from your back foot onto your front foot as you strike the ball. Get sideways on too which will allow good hip and shoulder rotation through the ball.